Summertime in Los Angeles is THE BEST! I’m always looking for ideas to enjoy the perfect weather, and fortunately, there are endless outdoor activities/events to choose from all around the city. 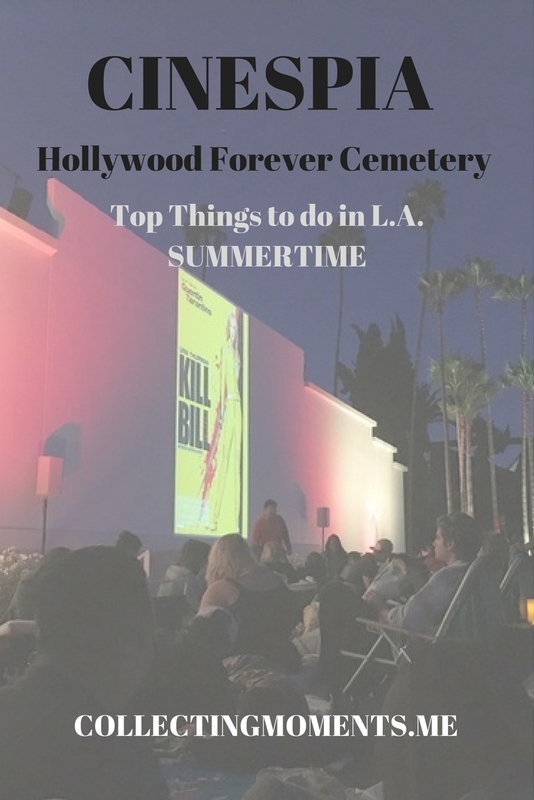 One of my ultimate favorites is attending at least once, as most Angelinos do (it’s a very popular Saturday evening outing in L.A), a screening at Hollywood Forever! I recently went with a small group of friends, and it was a lot of fun! I checked the calendar ahead of time to see which movie to go see, and realized I had never seen Quentin Tarantino’s Kill Bill, so we bought our tickets and were not disappointed. I have to say, watching Kill Bill for the first time at a cemetery was INCREDIBLE. I liked the movie a lot, but there was something unique about being in a cemetery while the rad soundtrack echoed through the summer night that made the whole experience one of a kind. Tickets to Cinespia are $16 and I also recommend paying for parking to make your life easier. Cinespia usually releases a monthly calendar so you can plan ahead, and the screenings run from June-September. Make sure to check it out!